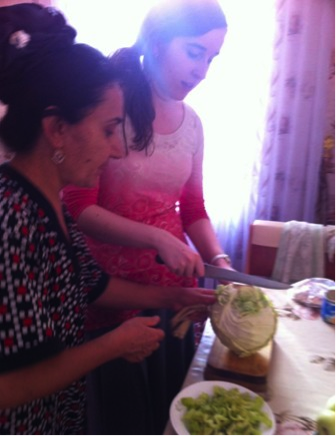 Leah, one of twelve NSLI-Y students living with a host family in Tajikistan for the summer, has found that cooking with her host family is a great way to bond with them. 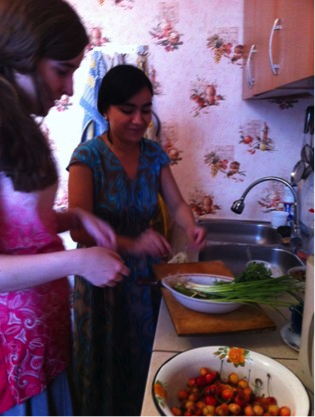 Not only that, but cooking and doing other every-day activities with her host parents and host sister also help her improve her Tajiki language skills. Through cooking, Leah is able to expand her knowledge of cooking terms and verbs, in addition to practicing listening comprehension. In order to retain and reuse the vocabulary she picks up, Leah carries around a notebook to record new words and definitions. During the month of Ramadan, Leah also got to put her newfound cooking skills to use, while helping to prepare evening Iftar dinners and learning about Ramadan from her host family. She learned that during Ramadan, the ninth month of the Islamic calendar, Muslims around the world observe a month of fasting in order to cleanse the soul and free it from impurities. Because they fast all day, they eat large meals in the morning before sunrise and at night after the sun sets. Leah got to help her host family prepare the evening Iftar, which they eat to break their fast, and then bond with them even further by eating together with them.